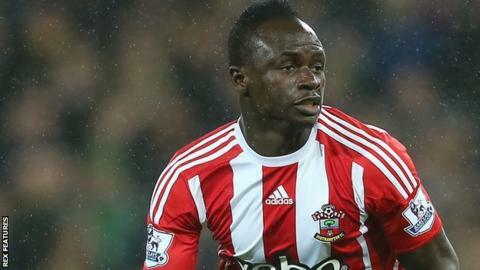 Southampton manager Ronald Koeman said he dropped Sadio Mane because missing a pre-match meeting was "unacceptable". The Senegalese midfielder started his side's 1-0 defeat by Norwich on the substitutes' bench, and appeared only for the final 10 minutes. "You have to respect your team-mates, the fans and the club because they pay good money for the players," Koeman told BBC Sport. "To change the line-up two hours before the game, it's unacceptable." The 23-year-old Senegal international, signed from Red Bull Salzburg in 2014, had featured in all of his side's 19 Premier League matches this season, scoring three times. "It's the second time, it happened one time last year when he was late at the stadium and today he was late for the meeting," Koeman added. "I cannot understand that these kind of mistakes can happen." Southampton were also hindered by the sending off of midfielder Victor Wanyama, two minutes before Alex Tettey's winner for Norwich.